The Russian American Institute of Medicine at St. Elizabeth’s Medical Center is dedicated to providing excellent health care to our large Russian patient population here in the Boston area, as well as to Russians living around the world. St. Elizabeth’s Medical Center has assembled many of Boston’s finest physicians in specialties, including cardiovascular medicine, cardiac/thoracic surgery, general surgery, oncology, internal medicine, urology and pulmonary medicine in order to provide Russians with care of the highest quality and best possible health care experience. 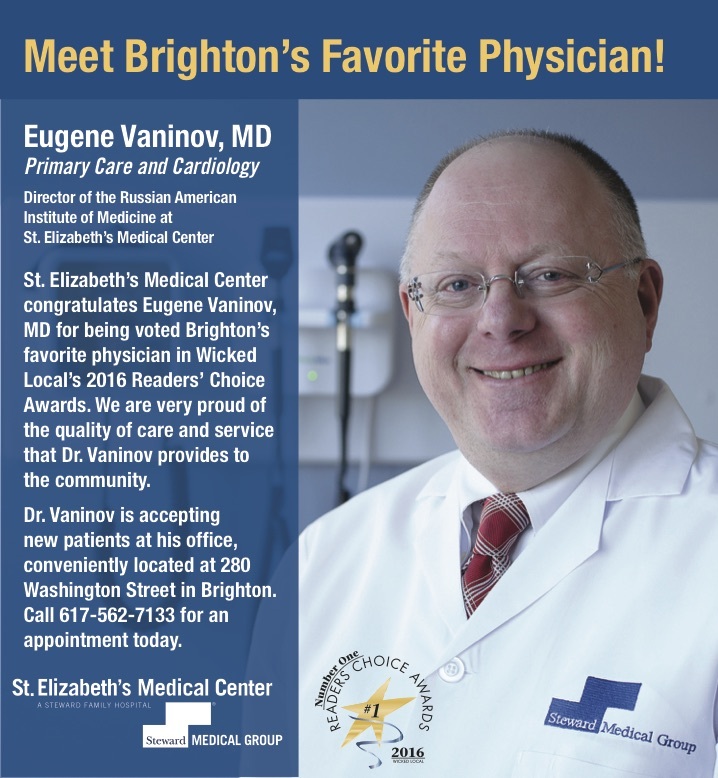 The Russian American Institute of Medicine is led by Eugene Vaninov, MD, a board-certified internal medicine physician who has been providing primary and cardiovascular care to the Russian population in Boston for over eighteen years. Dr. Vaninov has received numerous awards in recognition of his outstanding contributions to the field of medicine and dedication to the Russian community, including citations from the Governor and State Senate of Massachusetts, the Rabbi of Russia, and the U.S. Senate. He was awarded the Gold Medal of Peace from the Russian Peace Foundation for strengthening the relationship between Russian and American physicians. Dr. Vaninov is also an Assistant Professor of Medicine at Harvard Medical School. St. Elizabeth’s, a teaching hospital of Tufts University School of Medicine, is consistently recognized for providing the highest quality care. In 2012, Truven Health Analytics (formerly Thomson Reuters) named St. Elizabeth’s as one of the Top 50 Cardiovascular hospitals in the country – the only Boston hospital to earn this distinction. St. Elizabeth’s earned an A for patient safety from the Leapfrog organization, and more than 30 of our physicians were named to U.S. News and World Report’s Top Doctors List. St. Elizabeth’s is home to New England’s leading robotic-assisted, minimally invasive surgery program. We have a new, state-of-the-art radiation center and a new hematology/medical oncology unit in affiliation with Dana-Farber Community Cancer Care and one of the region’s top-rated maternity programs with a Level III Neonatal Intensive Care nursery affiliated with Children’s Hospital Boston. Our modern emergency room is equipped with the latest technology and has one of the shortest wait times in all of Massachusetts. Dr. Prokhor Pavlov (second from left), head of Cardiology and Radiology, Regional Clinical Hospital of Khanty-Mansysk, Associate Professor of Medicine Khant-Mansysk School of Medicine, Russia joins St. Elizabeth's physicians (from l to r) Dr. Joseph Carrozza, Dr. Eugene Vaninov and St. Elizabeth's president Kevin Hannifan. St. Elizabeth’s Medical Center, a teaching affiliate of Tufts University School of Medicine, is a world class center for treatment, teaching and research, as well as a community hospital that delivers the best in personal care. Located in a friendly residential neighborhood only minutes from downtown Boston, we offer ACGME accredited training programs and fellowships, as well as unaccredited physician training programs in many specialties. For more information regarding training programs for physicians in Russia, please contact Dr. Eugene Vaninov. At St. Elizabeth’s Medical Center, there are more than twenty Russian speaking physicians in specialties including primary care, allergy, anesthesiology, cardiovascular medicine, dermatology, hematology/oncology, hospital care, ophthalmology, physical medicine/rehabilitation, pathology, podiatry and urology. In addition, St. Elizabeth’s Medical Center has Russian translation services available 24 hours a day, seven days a week. Physician Biographies in Russian Read more about our expert physicians at St. Elizabeth's Medical Center translated in your own language, Russian. At St. Elizabeth’s Medical Center, there are more than twenty Russian speaking physicians in specialties including primary care, allergy, anesthesiology, cardiovascular medicine, dermatology, hematology/oncology, hospital care, ophthalmology, physical medicine/rehabilitation, pathology, podiatry and urology. Patient Testimonials Learn more about what our Russian and Russian-American patients say about us. Search for a doctor or request an appointment online at DoctorFinder or by calling 1-800-488-5959.